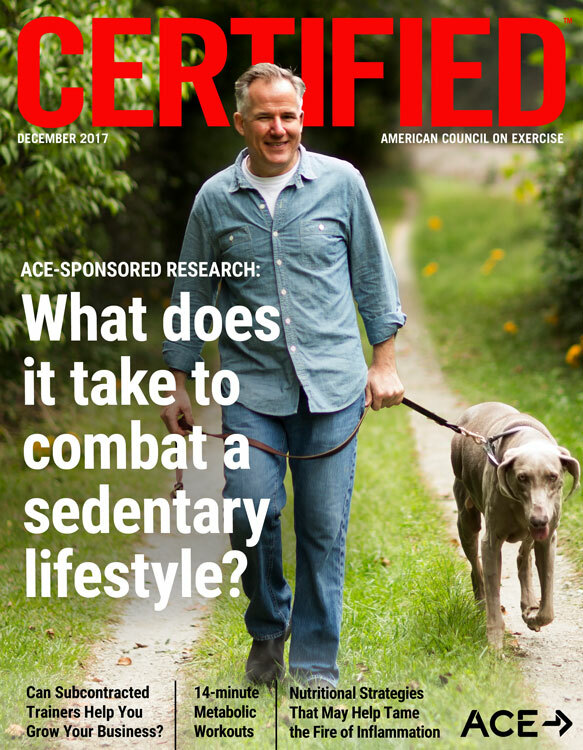 ACE - Certified™: December 2017 - ACE-SPONSORED RESEARCH: What Is the Optimal FIT to Reduce Sedentary Behavior to Improve Cardiometabolic Health? 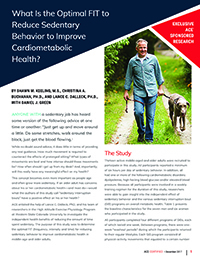 ACE-SPONSORED RESEARCH: What Is the Optimal FIT to Reduce Sedentary Behavior to Improve Cardiometabolic Health? Does Group Fitness Offer More Health Benefits Than Exercising Alone? While no doubt sound advice, it does little in terms of providing any real guidance. How much movement is required to counteract the effects of prolonged sitting? What types of movements are best and how intense should those movements be? How often should I get up from my desk? And, importantly, will this really have any meaningful effect on my health? 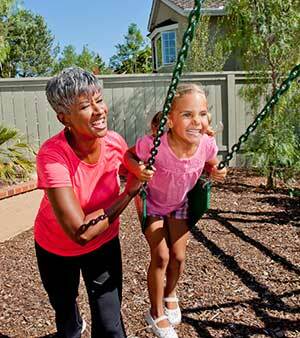 This concept becomes even more important as people age and often grow more sedentary. If an older adult has concerns about his or her cardiometabolic health—and most do—would what the authors of this study call “sedentary interruption bouts” have a positive effect on his or her health? ACE enlisted the help of Lance C. Dalleck, PhD, and his team of researchers in the High Altitude Exercise Physiology Program at Western State Colorado University to investigate the independent health benefits of reducing the amount of time spent sedentary. The purpose of this study was to determine the optimal FIT (frequency, intensity and time) for reducing sedentary behavior to improve cardiometabolic health in middle-age and older adults. 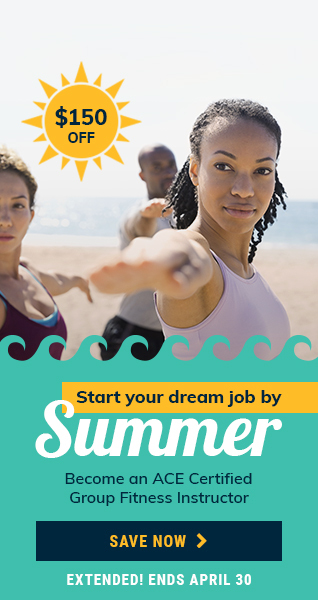 Thirteen active middle-aged and older adults were recruited to participate in this study. All participants reported a minimum of six hours per day of sedentary behavior. In addition, all had one or more of the following cardiometabolic disorders: dyslipidemia, high fasting blood glucose and/or elevated blood pressure. Because all participants were involved in a weekly training regimen for the duration of this study, researchers were able to gain insight into the independent effect of sedentary behavior and the various sedentary interruption bout (SIB) programs on overall metabolic health. Table 1 presents the baseline characteristics for the seven men and six women who participated in the study. 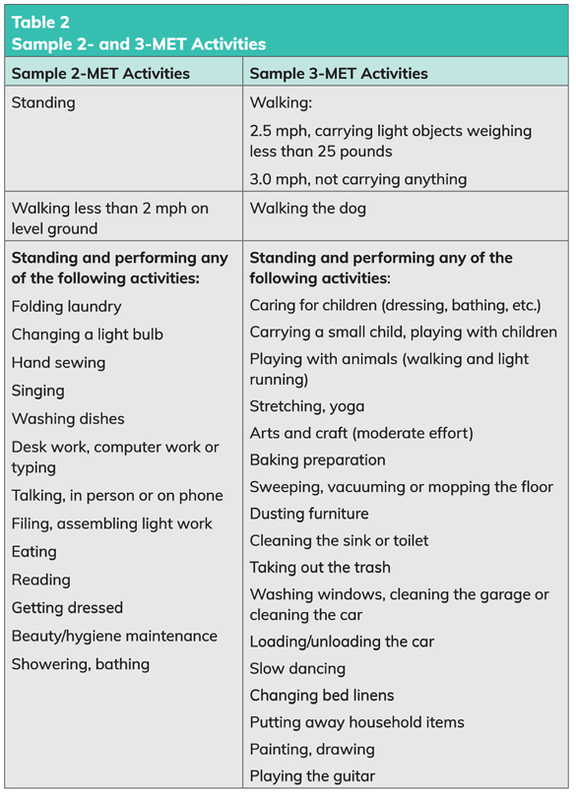 For example, an individual in the SIB1 program would stand up every hour during his or her sedentary time and perform one or more of the 2-MET activities for five minutes, then sit back down and resume the sedentary activity. Measures were taken at the same day and time each week during the eight-week intervention (four one-week SIB periods and four one-week washout periods). The measures included fasting plasma lipids, fasting blood glucose and resting blood pressure. Collectively, these values quantified the effect of each SIB program on the participants’ metabolic health. Throughout the study, the participants performed their usual exercise training programs. “That way,” explains Keeling, “the process would be less intimidating. 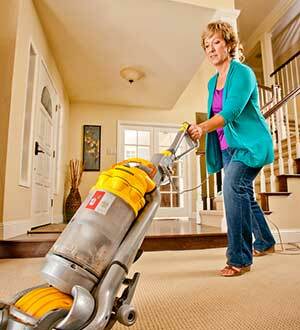 It also made more sense to have them do chores and other household activities that they would have to do anyway.” Keeling reports that some participants found the activities very easy, while others found them difficult, but manageable. Participants were instructed to perform as many of the 2- or 3-MET activities presented in Table 2 as they desired as part of their weekly SIB program, as long as they fit within the specified duration. Among the 13 participants, there was no significant difference between baseline and post-intervention measures of weight, maximal oxygen uptake (VO2max) or resting metabolic rate. 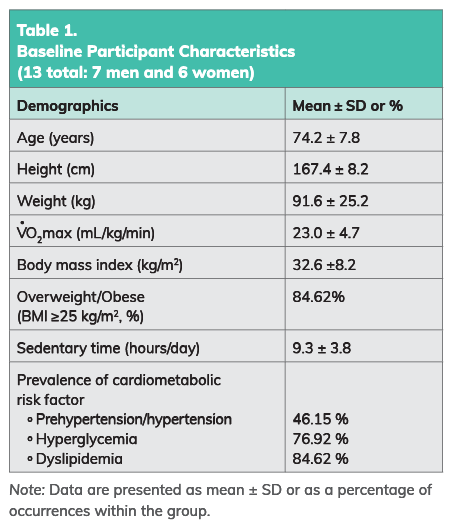 All participants fulfilled weekly measures of resting blood pressure and fasting blood concentration measurements of low-density lipoprotein (LDL), high-density lipoprotein (HDL), total cholesterol, triglycerides and glucose to allow comparisons between the various SIB programs and the control weeks (Table 3). HDL (“good”) cholesterol saw a favorable increase of 21.2% after SIB1 (2 METs, 5 minutes, every 60 minutes) and 18.4% after SIB4 (2 METs, 10 minutes, every 120 minutes). 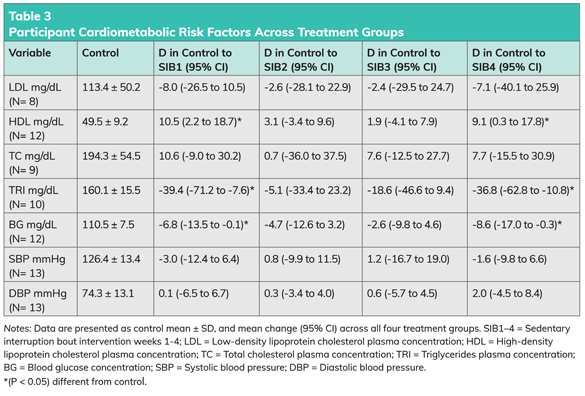 Triglycerides decreased by 24.6% after SIB1 and by 23% after SIB4. Blood glucose concentration decreased by 6.1% after SIB1 and 7.8% after SIB4. The changes following SIB2 (2 METs, 5 minutes, every 120 minutes) and SIB3 (3 METs, 5 minutes, every 120 minutes) were not statistically significant. It’s important to note that the benefits from each week of SIB were reversed after the participants returned to their normal sedentary behavior habits for one week. As with any behavior change, consistency is essential. This research demonstrates that low-intensity movement interruptions are an effective means of combatting sedentary behavior. If a person is capable and willing to get up and move once per hour, five minutes of 2-MET movements is sufficient to drive pretty dramatic swings in HDL, triglycerides and blood glucose. If getting up every two hours is more manageable, then the duration of the movement bout extends to 10 minutes, though the MET level stays the same. Duration and frequency proved more important than an increase in movement intensity, as illustrated by the fact that SIB3, which consisted of five minutes of 3-MET activity every two hours, did not yield substantial benefits while more frequent lower-intensity bouts did. What makes the findings of this study even more striking is the fact that regular exercise programs do not always lead to positive shifts in the data to the extent seen in this research. In other words, even a sustained exercise program may not be enough to improve cardiometabolic health if the individual is otherwise sedentary. “This research tells us how we can effectively manipulate interruptions in sitting time so that we can move beyond ‘don’t sit so much’ to something much more precise,” explains Dr. Dalleck. Table 4 presents the research team’s recommendations. 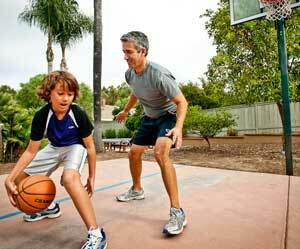 “We need to appreciate the independent role of not sitting in addition to getting regular exercise,” explains Dalleck. One final note: During the “washout periods,” the participants in this study could be described as “active couch potatoes.” In other words, although they were performing regular exercise programs, they were otherwise very inactive. The benefits seen during the weeks of the SIB programs quickly diminished when the previous behavior returned. In this study, researchers chose to compare the effects of physical activity at which two different MET levels? Among the 13 participants, there was no significant difference between baseline and post-intervention measures of weight, maximal oxygen uptake (VO2max) or________________. It’s important to note that the benefits from each week of sedentary interruption bouts program were reversed after the participants returned to their normal sedentary behavior habits for ___________. This study demonstrates that if a person is capable and willing to get up and move once every _______________, five minutes of 2-MET movements is sufficient to drive pretty dramatic swings in HDL, triglycerides and blood glucose.